When you can't sit down to do some modeling or painting or get over to your local game store for a small pick-up game, you find yourself filling your hobby time with other "hobby related" things. None of them are very productive really. 1. You check your favorite sites and then you check them again. Even though you know they won't post anything for another day or so, you keep checking back just in case you missed something. You never know. 2. You link surf into oblivion. You start following links to places and things you would never normally check out. You might start out with something like "how to paint white" and the next thing you know, you're reading about the life expectancy of a South American seahorse. 3. You stalk the large bulletin boards. Of course it only takes 15 seconds to catch up on what you missed since you last visited, but the next thing you know, you're giving someone advice about Warmachine even though you've never actually played a game. Worse yet, you find yourself seriously debating the pros and cons of kitting out a space marine tactical squad with rebreathers in case they lose their helmets despite it not being an option in the codex. 4. You make big plans and scrap those for even bigger plans. Even though you don't have the money or the time, you plan out your 34 thousand point Sisters of Battle force that you're going to convert every model in. Then you write the list a few million times until you get it just right. Once you have your list, you head over to Forge Word and plan out just how many Titans you're going to need first your first three Apocalypse force org charts. 5. You fiddle with your blog. That sounds much dirtier than it really is. You start looking around for ways to "improve" your site and the next thing you know, you're adding a live streaming polar bear cam to your site because it seems relevant to your Dark Eldar or at least it did last night. 6. You don't use your time wisely doing something like cleaning up. 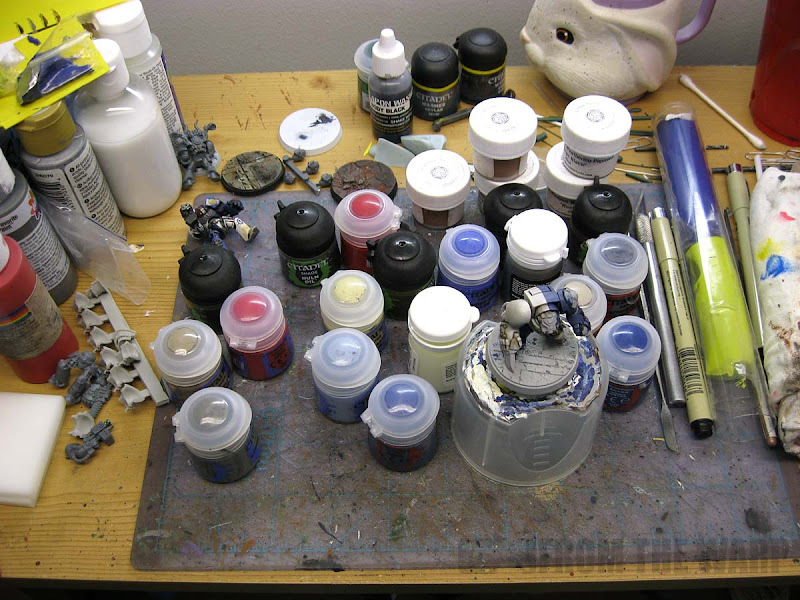 Even though you may have the time to go through all your old paints and finally organize your bits, you don't do it because you don't want to upset the delicate balance you've managed to achieve up to this point. Besides, if you organized everything, how would you find it then? 7. You watch official GW videos for things you might have missed. Thinking you might have missed something during one of the first hundred times you watched it, you watch the preview for the Daemons of Chaos Advance Order video again. They might have snuck something in there since you last viewed it 3 minutes ago. Seriously though, we all have our ways of filling our time with these kinds of things. I don't have any way to model or paint right now, so I'm guilty of most of these (especially the seahorse thing, it's 1 to 5 years depending on the species). Hobby time is our great escape, enjoy it and use it however you want. As for me, I've got some more seahorse research to do. Outside of the hobby, what compete's for your free time? If you've got any questions about something in this post, shoot me a comment and I'll be glad to answer. Make sure to share your secret hobby fillers in the comments below... we all have them. Time to own up to them. And, where can I get this live polar bear cam..? Ah, it's funny because it's true. Ever noticed that a Zoanthrope looks kinda like a seahorse? I'm just admitting that I find a variety of ways to fill my hobby time when I can't do any real modeling or painting. OMG! That's me! Right now! #6 is very true for me. I have Tau arms, IG arms, and Space Marine backpacks all over my desk, but if I move them I am afraid I'll never find them again. #4 is true as well. I have a spreadsheet at work with tabs upon tabs of army lists. #4 is huge for me. I plan out elaborate armies, conversions, or Allies detachments. Then I remember that I have thousands upon thousands of points of Space Marines that I vowed to paint before I ever buy a new kit, sigh, and remove all the bitz from my shopping carts and eBay watch lists. I sometimes go to work and do actual work when not hobbying. Only some times though. So true about the 34 thousand point SoB army! I'm also guilty in the past of planning "the next big project" while I'm already knee deep in various other ones. like my Armageddon themed Death Core of Krieg army, complete with Forge World armoured battalion! it will be done, in this life or the next! Right there with you. I made a name-generator chart for my marines. But that wasn't enough, so I broke it down by planets. I'm now in the process of generating family heraldry for every single marine. Nevermind the fact that I can't paint my way out of a wet paper bag (bad analogy), somehow I'm going to get complex coats of arms on thirty little shoulder pads. I do some of those things even when I'm painting. Sometimes I swear I like reading about the hobby more than doing the hobby. Thanks for the humour. Hopefully you're doing well. A very accurate list. I keep finding myself tweaking and re-tweaking 2000 point army lists, which now include allies and fortifications. The problem is that I don't have more than 1250 points of Marines built. As for the other stuff, my Aegis Defense Line and Imperial Bastion are still on their sprues and I don't actually own any non-Marine models yet. I have well over 4000 points of Marines waiting to be built, so there's no rational reason why I'm already planning an allied Imperial Guard force. Or spend hours on Wiki expanding your horizons, then reference checking the articles, and reference checking those references. Then you get bored when you can't access the primary sources or can't read that language, so you go back to Wiki to look at something else and end up 500 years and a continent away from where you started. All the while neglecting the fact that the bits box really does need sorting and there's a ton of stuff on sprue that still needs clipping into it. So then you go play Mechwarrior Online or Day Z for a bit, and realise it's 2am and that's why you can't see straight. well whilst its no-where near as bad as what happened to you Ron, I broke my left elbow about 4 weeks ago and am only just able to start painting again (although the holding/turning of figures should be great therapy). I certainly read a lot in that time, and i managed to completely re-organise my paints and spares, which i'd never have done if i was actually painting. I also put together some fightable army lists for me and my eldest to play with, which i'd been meaning to do for ages. Yeah pretty much guilty of everyone of those, especially the fiddling with your blog entry. Wow, you hit the nail on the head here! It appears as though some of you all are far worse off than I am. It can be fun though to do these "other" things sometimes. Even though they may not be modeling and painting, I feel like they help me recharge my batteries when it comes to the game and I'm sure they do something similar for you all as well. YOU CAUGHT ME IN THE ACT!